Part of our Red Rose Event Pack, a full bleed, full color poster with a red rose background. 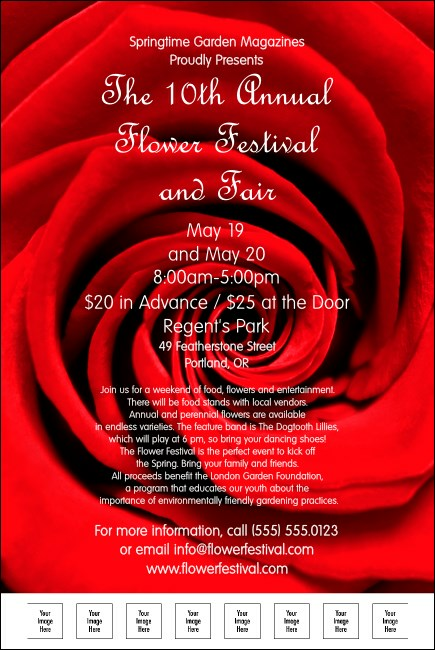 The Red Rose poster template has 8 spaces for your sponsors' logos, and, works superbly for many types of events, including general purpose, prom, dance, Valentine's Day, fashion show, Spring, performing arts, music, and more. Make sure to browse through the extensive gallery of designs at TicketRiver.com.au.